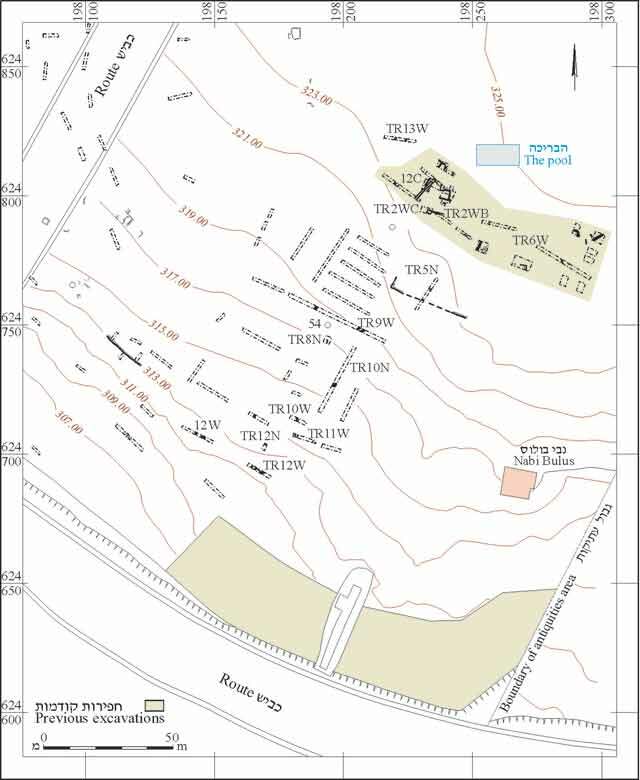 During August 2007, a trial excavation was conducted in a pool at the site of Khirbat en-Nabi Bulus near Ramat Bet Shemesh (Permit No. A-5207; map ref. 19820–1/62480–1), with the aim of checking its possible reconstruction. 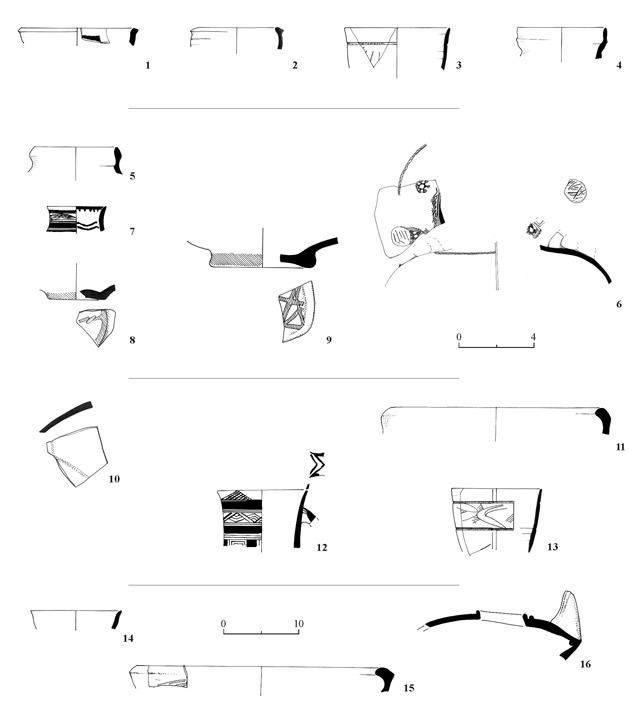 The excavation, undertaken on behalf of the Israel Antiquities Authority and underwritten by the Ministry of Construction and Housing, was directed by E. Kogan-Zehavi, with the assistance of R. Abu Ta‘a (administration), V. Pirsky (surveying), T. Sagiv (field photography), C. Hersch (drawing of finds) and C. Amit (studio photography). 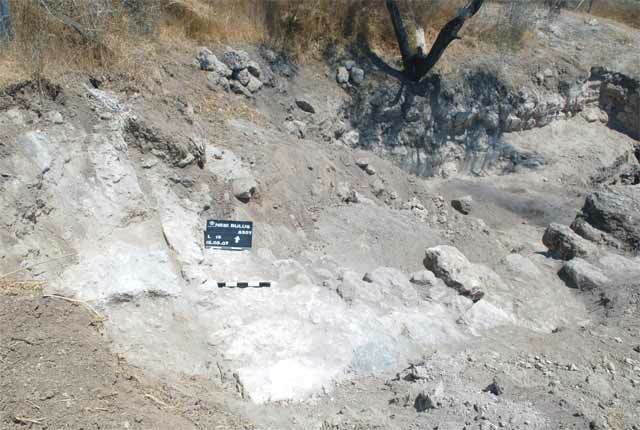 The site is situated on a low hill, c. 500 m west of Khirbat el-‘Alya where remains that dated to the Late Hellenistic–Early Roman, Byzantine, Abbasid and Mamluk periods, in addition to potsherds from the Chalcolithic period and Early Bronze Age II were discovered. Potsherds from the Middle Bronze Age and the Iron Age II (ESI 17:94; HA-ESI 117) were collected on the surface at the foot of the hill and to its south. Remains dating to the Mamluk period were discovered in the western part of the site, near the excavation area. 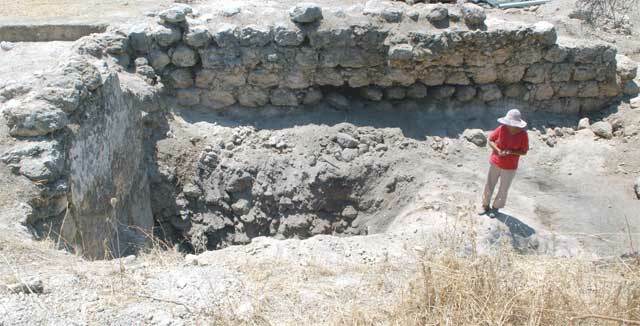 The excavation was conducted in a pool (external dimensions c. 7.5×16.0 m, internal dimensions 5.5×13.5 m; Figs. 1, 2) that was aligned northeast-southwest. 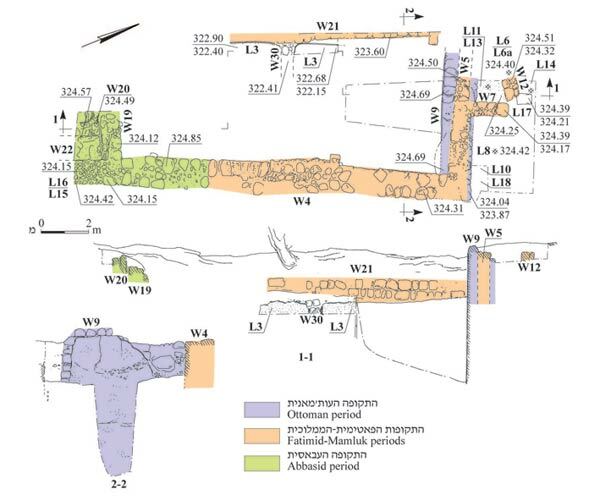 After clearing modern debris and excavating a probe trench with the aid of mechanical equipment, trenches and excavation squares were opened next to the northern and western walls (Area A), outside the pool, adjacent to the northern wall (Area B) and next to the southeastern corner (Area C). Despite the limited scope and duration of the excavation, three construction phases were discerned and ceramic artifacts dating to the Abbasid, Fatimid–Mamluk and Ottoman periods were discovered. Walls delimiting the pool in the north (W5), west (W21) and east (W4) were exposed. These were built of carelessly dressed stones (average size 0.2×0.3 m) and reinforced with small stones inserted in-between. Remains of two pillars were discovered in the eastern W4 (width 1.1 m), indicating that the pool was covered with a vault. Although only the inside of the western W21 was exposed, it is assumed that its width was identical to W4 and it incorporated two pillars, opposite those in W4. A probe trench (L3; length c 4 m; Fig. 2: Section 1-1) was excavated on the inside of W21 and a surface coated with gray waterproof plaster was exposed. The pool was delineated on the north by a broad wall composed of two adjacent walls. The outer wall (W5; width 1 m) was built of fieldstones bonded with plaster and was tied into the corners of Walls 4 and 21; hence it was constructed together with them. A wall (W9; width 0.3 m; Fig. 3), added as a repair to the interior of W5 and preserved to its full height, was coated with three layers of plaster; the top of the wall was adapted to a vaulted roof. The inside of the wall, in a trench dug by mechanical equipment, was exposed to a height of 6 m, without reaching its base (Fig. 2: Section 2-2). The pool was bisected in an east–west direction by a wall that was plastered on both sides (W30; thickness 0.5 m; Fig. 2: Section 1-1). The fill in the pool contained a scant amount of mixed ceramic finds that included body fragments of ‘Gaza’ ware (not drawn), dating from the Ottoman period to the present; accordingly, the pool was probably used during this period as well. The Early Phase. Two courses of W5 were exposed. It was abutted from the south by a perpendicular wall (W7; exposed length 1.7 m, width 0.5 m), built of carelessly dressed stones and preserved a single course high. A single course of an end of a wall (W12), oriented east–west, was exposed in the northern part of the square; a small section of a floor north of it was coated with a light colored plaster (L14). The walls were abutted by a floor of tamped earth (L13). 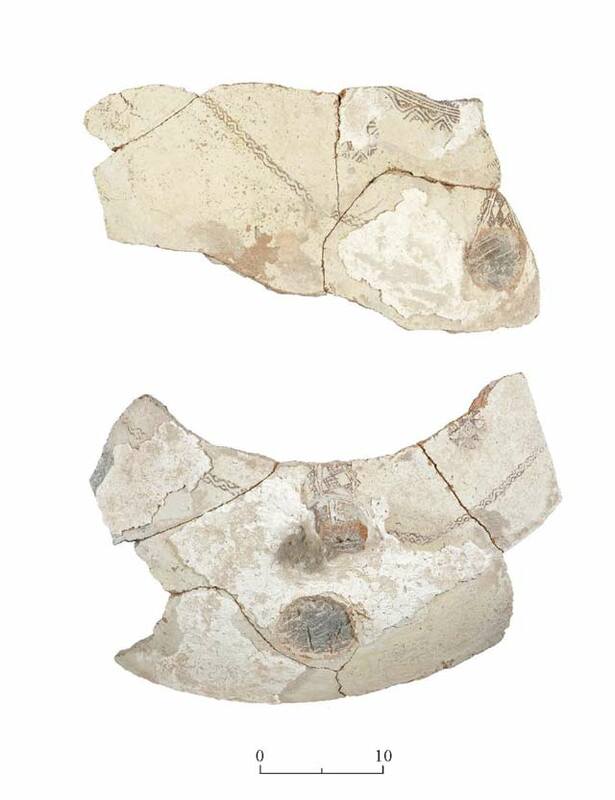 The ceramic finds discovered on Floors 13 and 14 included two bowl rims (Fig. 4:1, 2), a jug decorated with incising on its neck (Fig. 4:3) and a jar rim (Fig. 4:4) that dated to the eleventh–thirteenth centuries CE. The Late Phase. The elements ascribed to this phase include a tamped earthen level above Floor 13 and W12 (L6A), and east of W7 and north of W5 (L8). Below Floor 8 was collapse of dressed stones (L10) that were different than the stones of W7 and they probably fell from W5 before it was repaired. Body fragments of handmade pottery vessels with painted decorations, dating to the Mamluk period or later, were discovered on Floor 6A. Potsherds dating to the Mamluk–Ottoman periods were discovered on Floor 8, including a jar rim (Fig. 4:5), parts of a large handmade jar decorated with painting and bearing traces of plaster, possibly evidence that it was embedded in the floor (Figs. 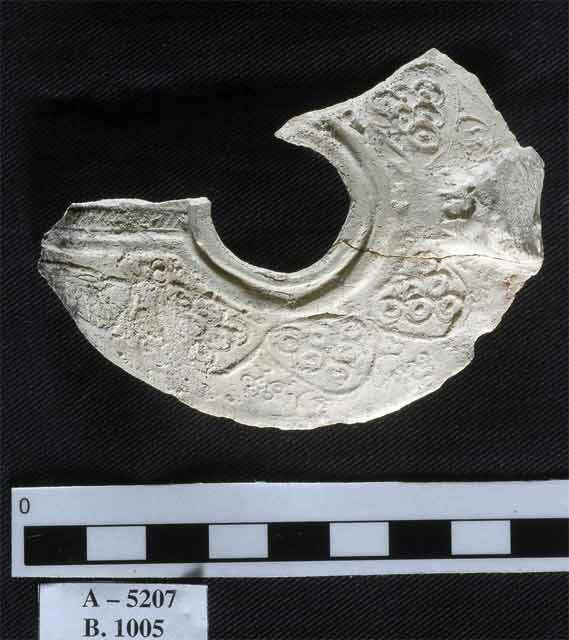 4:6; 5) discovered near W7, a jug rim (Fig. 4:7) and the bases of two handmade jugs decorated with red paint (Fig. 4:8, 9). 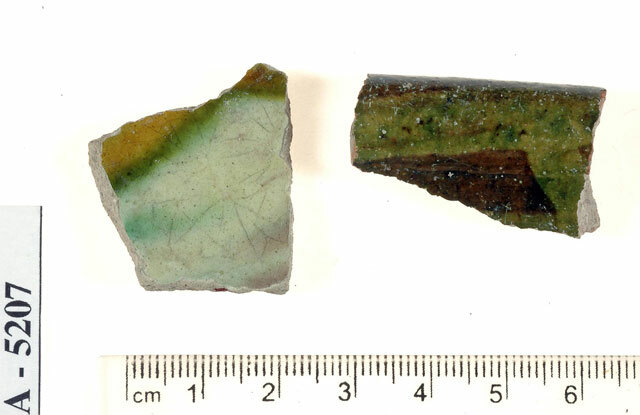 Among the potsherds recovered from below Floor 8 and above the top of the stone collapse was the rim of a green-glazed slip-painted bowl (Figs. 4: 10; 6), a deep bowl (Fig. 4:11) and a jug rim decorated with incising (Fig. 4:13) that dated to the eleventh century CE, and a rim of a handmade jar decorated with red paint (Fig. 4:12), dating to the Mamluk period. The southern side of the pool was poorly preserved and the wall that delimited it from the south was only exposed in the probe trench. The walls in the southeastern corner (W4, W19) were dry built of large ashlars, carefully fitted to one another (0.3×0.4 m; Fig. 7), unlike the upper parts of Walls 4, 5, 9 and 21 that were exposed in Area A. It therefore seems that they should be ascribed to the pool’s original construction phase. The top of a plastered wall that abutted W19 from the south (W22; width 0.5 m) was discovered in a small area (1×3 m). Parallel to and adjacent to W19, and just to the west of W22, was a thin wall, plastered on both sides (W20; width 0.2 m; Fig. 2: Section 1-1); it was possibly a plastered channel built together with W22. A layer of pebbles that may be the foundation of a floor (L15) was deposited south of W22. Fragments of pottery vessels from the Abbasid period were discovered in the fill above the pebble layer (L16), including a buff-ware bowl with a plain rim (Fig. 4:14), a deep bowl (Fig. 4:15) and a fragment of a lamp with a tongue-like handle (Figs. 4:16; 8). The original construction phase (Walls 4 and 19) cannot be dated with certainty; however, it can be stated that the pool had already been in use during the Abbasid period, when additions were built to its south (Walls 20 and 22 and L15). Walls were built above the foundations in the north, east and west (Walls 4, 5 and 21) in the Fatimid–Mamluk periods and additions were constructed to the north. The pool was repaired in the north (W9) during the Ottoman period or later. These results correspond in part to the history of the nearby settlement that existed in the Abbasid and Mamluk periods. 3. Walls 4 and 9, looking east. 6. Fragments of glazed bowls. 7. Walls 4, 19 and 22 and Locus 15, looking west.